The 5-star ​Villa Collection is a unique​ ​luxurious​ resort​ ​concept, discreetly nestled into the hillside above Elia Bay​​. 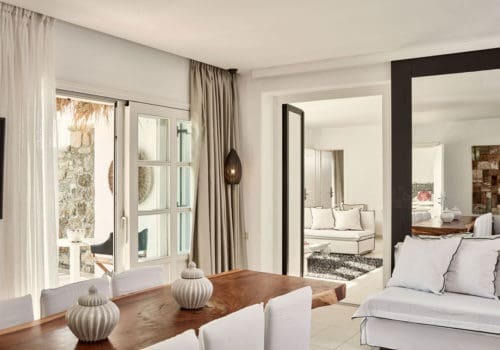 ​The superb villas offer the unbounded opulence of a private house on Mykonos, complemented by personalised 5-star service around the clock. Take in the 360-degree panorama on the vast entertainment deck with its cool bar, epicurean restaurant and saltwater infinity pool. 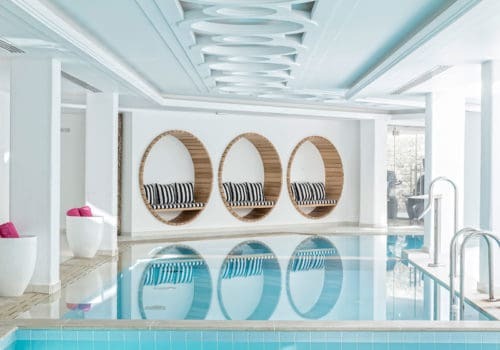 Relax in the the world-class Thalasso spa, or simply venture down to the fine sand beach where parasols stand to attention over private loungers. 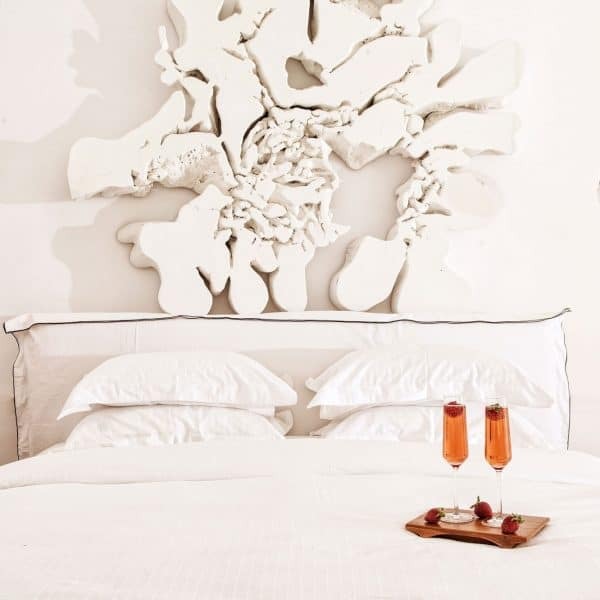 Comfortably sized and stylishly decorated, the Prestige rooms offer world-class conveniences and lifestyle luxury, complemented by the 5-star services of the experienced and welcoming staff. 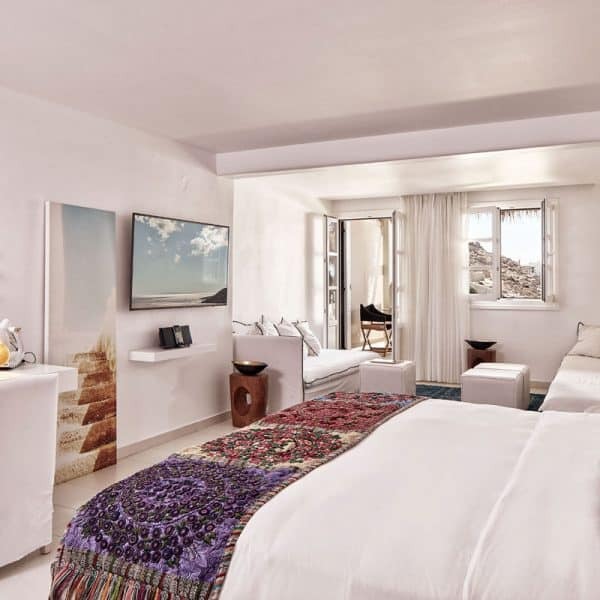 The Sea View room has an elegant living space that opens onto a private balcony with panoramic views of the beautiful beach of Elia and the Aegean. A bathroom with separate rain shower and freestanding bath is stocked daily with exclusive products. The Prestige Sea View is also available with Jacuzzi or private pool. This room accommodates 2 guests, with a 3rd at a premium. 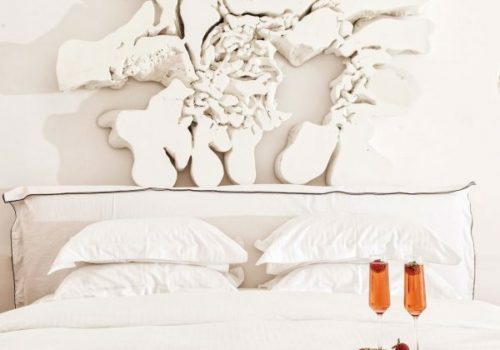 The Exclusive room is an intimate and tranquil haven that affords effortless ease and memorable moments. 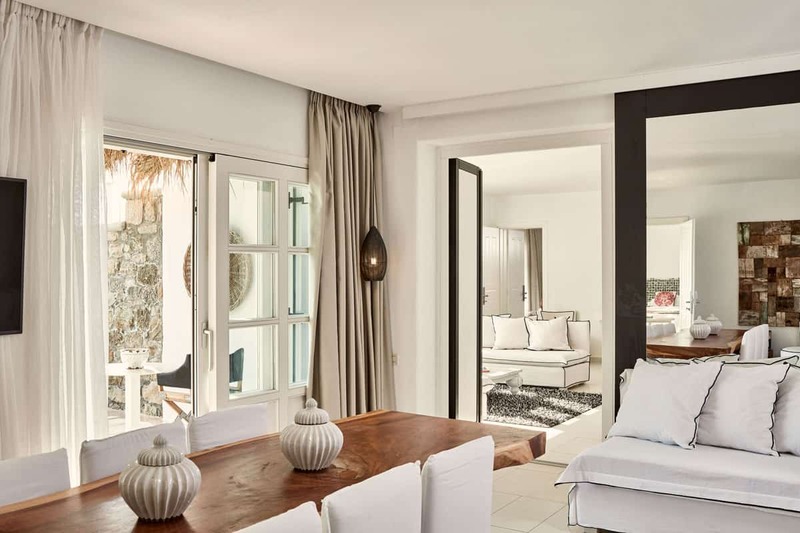 Amenities include a spacious bathroom with separate rain shower, king-size or twin beds as well as a sofa bed in an elegantly appointed living area that opens out onto the balcony with full sea views. 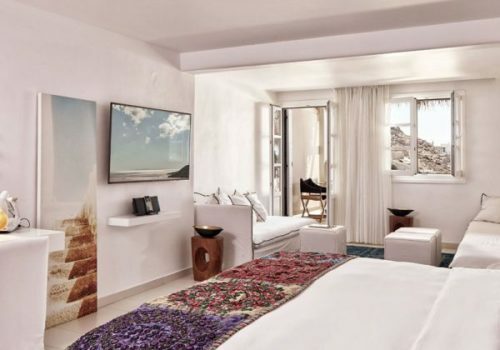 This unequalled luxury is accompanied by exceptional service that pairs the famous tradition of Greek hospitality with 5-star standards to ensure a memorable vacation experience. The Exclusive room is also available with a full sea view, as well as full sea view with a Jacuzzi or a private pool. It can accommodate up to 3 adults, or 2 adults and 2 children up to 12 years of age. 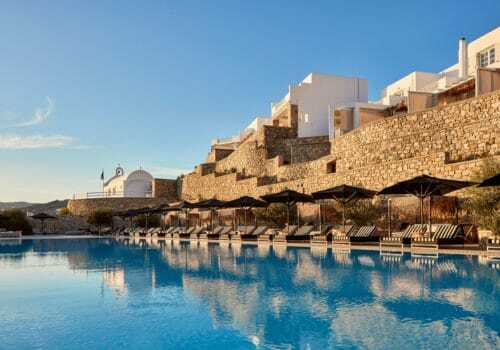 Leaning into the mountain, the terraced villas have uninterrupted views of the Aegean, culminating in a 360-degree panorama on the vast entertainment deck with its cool bar, epicurean restaurant and saltwater infinity pool. Magnificent interiors offset the local vernacular with contemporary design, investing sophistication and comfort in every detail. 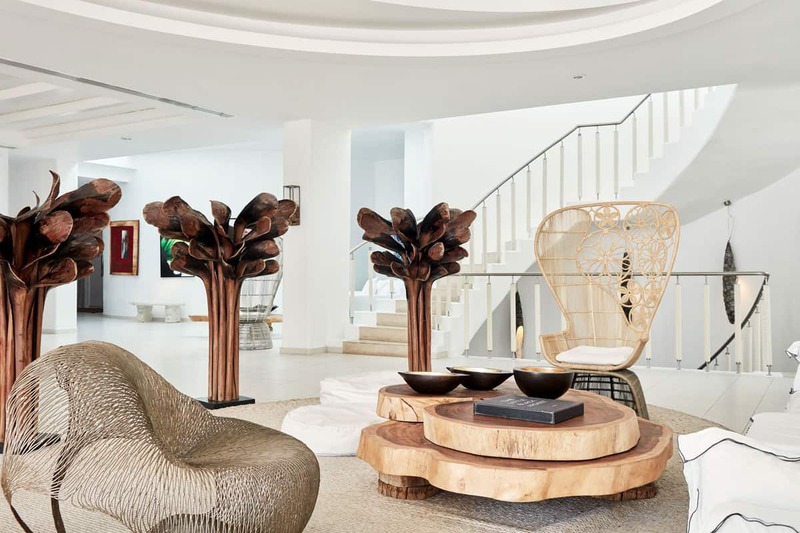 You’ll enjoy the immediate proximity to the beach at Elia that true connoisseurs have come to know as one of the island’s most beautiful beaches, as well as the panoramic views from the sundeck with its spectacular saltwater infinity pool. 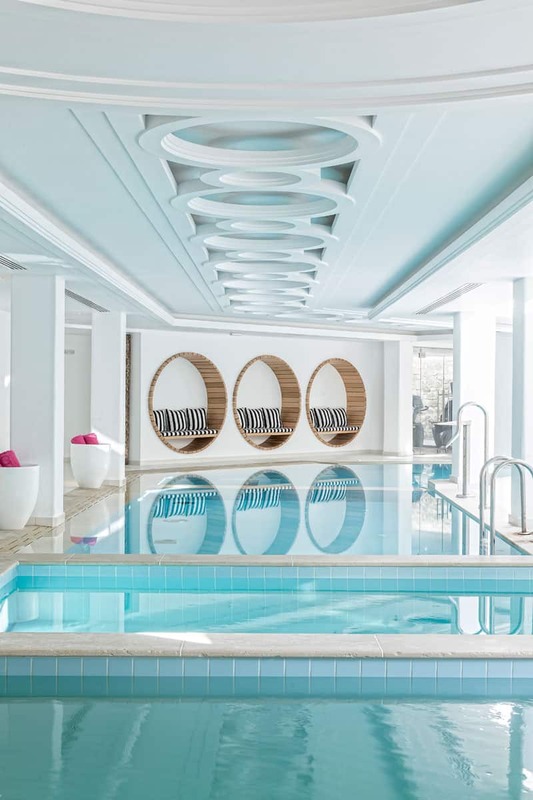 You can indulge in exceptional spa treatments, savour epicurean meals, perhaps clear your conscience working out at the fitness gym, then turn to the guest services for explore anything further afield. As a guest of the Villa Collection, you have the Myconian Collection at your feet. The sister hotels in Elia – the Utopia Relais & Châteaux, the Avaton Design Hotel, and the Royal and Imperial Leading Hotels of the World – all await you with an exciting variety of restaurants, pool bars and spa treatments to be explored at your leisure and with the guidance of the informed and friendly staff. Start the new day with a superb breakfast in the airy Nouveau day restaurant. Follow the aromatic scent of freshly baked bread and ground coffee and you will find international buffet classics, a rich variety of fresh cut fruit, home-smoked fish, local delicacies, Greek specialities such as stuffed vine leaves or yogurt made from local dairy, and, naturally, chilled champagne on ice. At your table overlooking the sea, friendly waiters will take your orders for eggs done your way, freshly brewed, steeped or pressed beverages, or anything else you may desire from the à la carte menu. The culinary experience at the poolside a-la-carte restaurant Cabbanes surpasses all expectations and requires both appetite and unbounded hedonism. Expect a subtle culinary adventure that draws on the best in local produce, served by candlelight in a breathtaking setting under the the star-studded night sky, with views across a moonlit sea. The executive chef Thodoris Kyriakidis trained at A-listers’ favourite Michelin-starred ‘One Lombard Street” and the ultra-exclusive VIP club ‘5 Hertford Street’, as well as for the past 5 years as the Executive chef for the Myconian AVATON. He has mastered the creative fusion that relies on the excellence of the freshest local and seasonal ingredients, as well as select imported specialities. Taking you on a culinary travel through the Mediterranean with inspirations from Italy and France, it is ultimately a declaration of love for the unique flavours of Greek cuisine and produce. An extensive wine list of rare Greek vintages, fine international wines and champagnes complements this extraordinary dining experience, while the hospitable and attentive service staff tend to your every need with the seemingly effortless yet perfectly trained ease of a synchronised ballet. Be prepared for à la carte fine dining at its best. There is no mistaking the cool elegance of this poolside bar. Even though guests can be served at their loungers, they return time and again throughout the day to place their orders in the shade of a shaggy thatch canopy that rustles in the breeze. Bartenders with masters in mixology shake and stir anything from innocent smoothies to old classics and new concoctions. To satisfy a spot of hunger or a sudden craving at any time of day, there is a delicious selection of salads and snacks, light entrées and fresh marine delicacies such as oysters, sea urchins or caviar. And, of course, a select wine and champagne menu. Certain circadian rhythms prevail, and for those in the know, sunset drinks at the Infinity Bar are an absolute must, against the backdrop of a technicolour sky and to the almost otherworldly strains of live harp music. After dark, the pace changes to the sounds of a live DJ and the fine wines, whiskies and signature cigar collection come out to play. For those rare evenings when you feel like ‘staying home’ to catch up on sleep, work or TV entertainment, we offer a delicious in-room menu with something exceptional for everyone’s taste, guaranteed to arrive as hot or as chilled as the chef would have it. Whether you wish to arrange for a private and memorable dining experience, or simply enjoy a meal that’s not on the menu, a personal chef and his team are always at your disposal, ready to demonstrate their culinary prowess and prepare your favourite dishes in the privacy of your own suite or villa. The in-house chef services also include daily fresh grocery delivery, a unique selection of coffees and teas, breakfast served by your personal chef in your suite or villa, tailor-made romantic dinners, special meals, fully-catered parties and events, as well as pool lunches upon request.